A Seasonal Customer Service Representative professionally handles all incoming calls and assesses the needs of the customer, the job template of these Seasonal Customer Service Rep includes executing some key duties such as – building trust and creating rapport through interactive communication, providing accurate and relevant information, accessing database and delivering accurate results, verifying data from account and updating information, using proper protocols, transferring calls to related personnel, recording call details, processing customer payment accurately, effectively navigate data system, resolving issues courteously and adhering to established standards for enhancing productivity, quality, shared values and attendance. 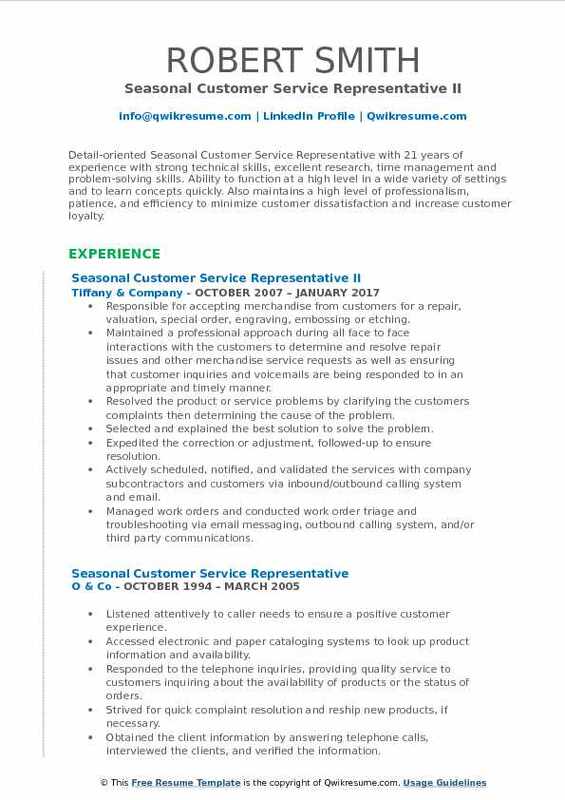 The most successful Seasonal Customer Service Representative Resume emphasizes conflict resolution proficiency, employee scheduling, and ability to multitask like navigate and speak over phone simultaneously and proficiency in Prevalent PC Technologies. To make this job post as a Career, candidates should include a High School Diploma as a minimum qualification. Objective : Seasonal Customer Service Representative with 4 plus years of experience in the Technology domain is seeking to obtain an administrative assistant position that will utilize my many skills and abilities. Providing information and documents complaints regarding financial institutions and financial products. Reporting directly to the Customer Service Supervisor, and takes direction from the Customer Service Manager. Evaluating the call in order to know when to transfer the caller to a Customer Service Representative II. Assisting with side-by-side mentoring for new employees during the training and after the training, as needed. Maintaining a current understanding of the programs standard operating procedures, processes, and program policies as provided during training. Utilizing scripts, standard operating procedures, and training materials to respond to inquiries in a courteous, timely and professional manner. Providing accurate responses and documentation of inquiries and complaints from consumers. Adhering to the privacy act as it relates to the confidentiality of information received. Continually looking for and suggest process improvements, which will benefit GDIT and our customers (internal and external). 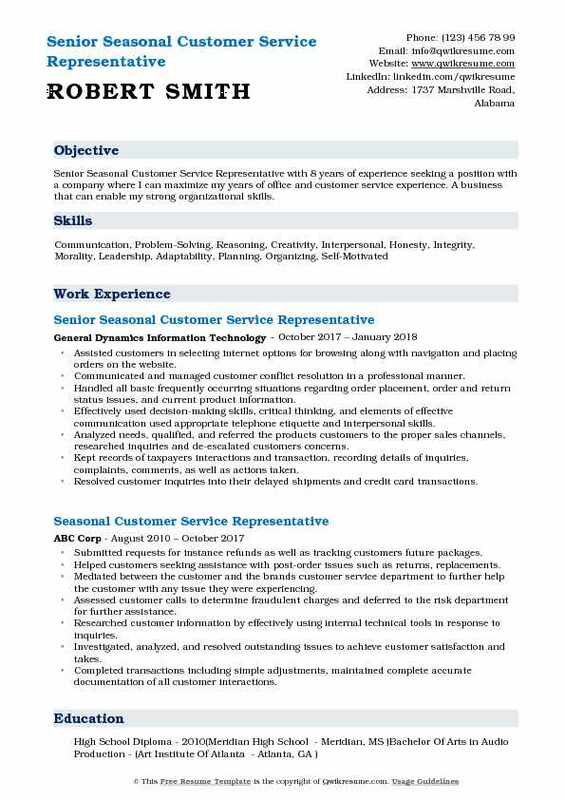 Objective : Seasonal Customer Service Representative with 2 years of providing superior customer service at local and national levels. Creative problem-solver with the ability to resolve conflict, improve morale, and motivate others to work productively as a team. 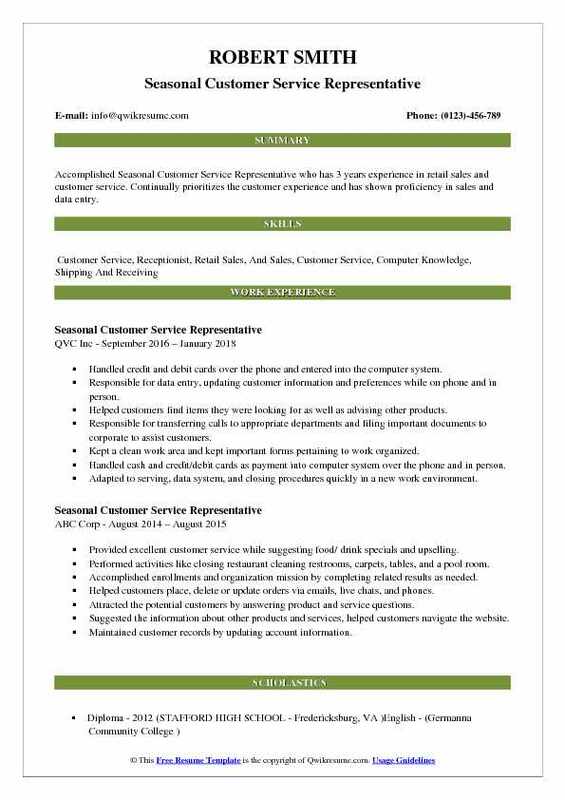 Worked as an inbound customer service representative. Assisted participants with all aspects of tax-advantaged benefit programs such as flexible spending accounts (FSAs), health savings accounts (HSAs), health reimbursement arrangements (HRAs) and commuter accounts. Consistenlty provided outstanding customer service in a high stress environment. Ranked number 12 out of 131 customer service agents at the end of my assignment. Created and submitted escalated cases and trendsetters to proper departments for approvals and or log updates of inventory, pricing, descriptions online as well as in-store. Resolved incoming calls from customers, vendors, store associates, carriers, financial institutes, online/in-store orders, complaints and billing inquiries. Answered hi-volume calls pertaining to online services, policies and account holders benefits. Worked efficiently with vendors, and consumers to ensure seamless and accurate deliveries. Successfully resolved the customer service issues stemming from order issues. 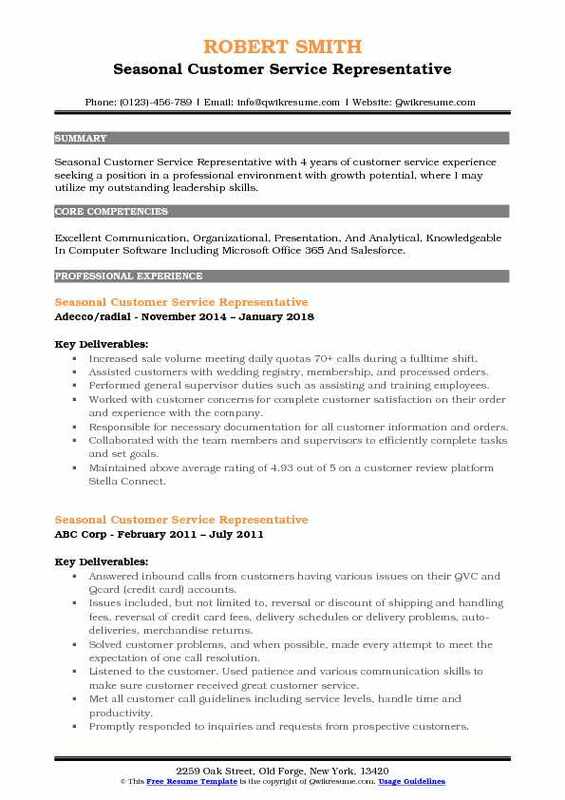 Objective : Accomplished Seasonal Customer Service Representative who has 3 years experience in retail sales and customer service. Continually prioritizes the customer experience and has shown proficiency in sales and data entry. Handled credit and debit cards over the phone and entered into the computer system. Responsible for data entry, updating customer information and preferences while on phone and in person. Helped customers find items they were looking for as well as advising other products. Responsible for transferring calls to appropriate departments and filing important documents to corporate to assist customers. Kept a clean work area and kept important forms pertaining to work organized. Handled cash and credit/debit cards as payment into computer system over the phone and in person. Adapted to serving, data system, and closing procedures quickly in a new work environment. Assisted the customers in making buying decisions by identifying and evaluating customers needs, and making product recommendations based off of this analysis. Supported the Manager with motivating, engaging, coaching and training fellow associates. Maintained and improved quality results by adhering to standards and guidelines, recommended improved procedures. Updated the job knowledge by studying new product descriptions, participating in educational opportunities. Summary : Detail-oriented Seasonal Customer Service Representative with 21 years of experience with strong technical skills, excellent research, time management and problem-solving skills. Ability to function at a high level in a wide variety of settings and to learn concepts quickly. Also maintains a high level of professionalism, patience, and efficiency to minimize customer dissatisfaction and increase customer loyalty. Responsible for accepting merchandise from customers for a repair, valuation, special order, engraving, embossing or etching. Maintained a professional approach during all face to face interactions with the customers to determine and resolve repair issues and other merchandise service requests as well as ensuring that customer inquiries and voicemails are being responded to in an appropriate and timely manner. Resolved the product or service problems by clarifying the customers' complaints then determining the cause of the problem. Selected and explained the best solution to solve the problem. Expedited the correction or adjustment, followed-up to ensure resolution. Actively scheduled, notified, and validated the services with company subcontractors and customers via inbound/outbound calling system and email. Managed work orders and conducted work order triage and troubleshooting via email messaging, outbound calling system, and/or third party communications. 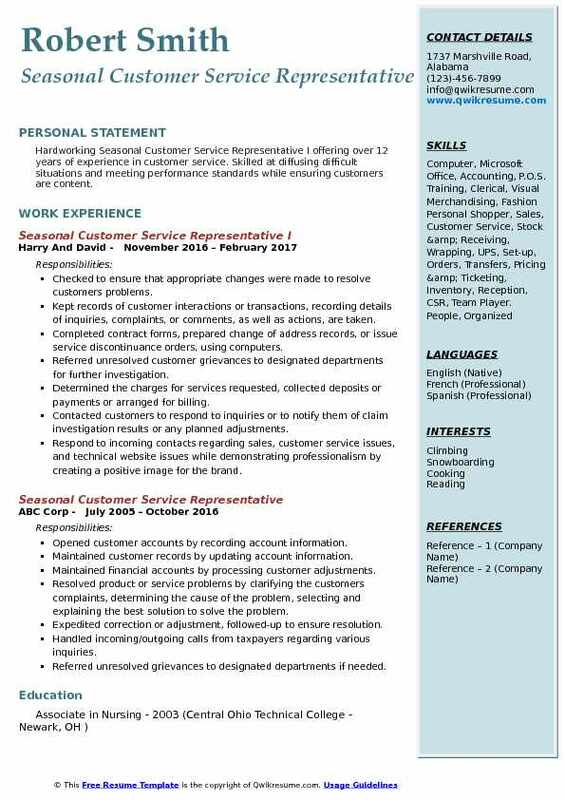 Summary : Hardworking Seasonal Customer Service Representative I offering over 12 years of experience in customer service. Skilled at diffusing difficult situations and meeting performance standards while ensuring customers are content. Checked to ensure that appropriate changes were made to resolve customers problems. Determined the charges for services requested, collected deposits or payments or arranged for billing. Contacted customers to respond to inquiries or to notify them of claim investigation results or any planned adjustments. Respond to incoming contacts regarding sales, customer service issues, and technical website issues while demonstrating professionalism by creating a positive image for the brand. 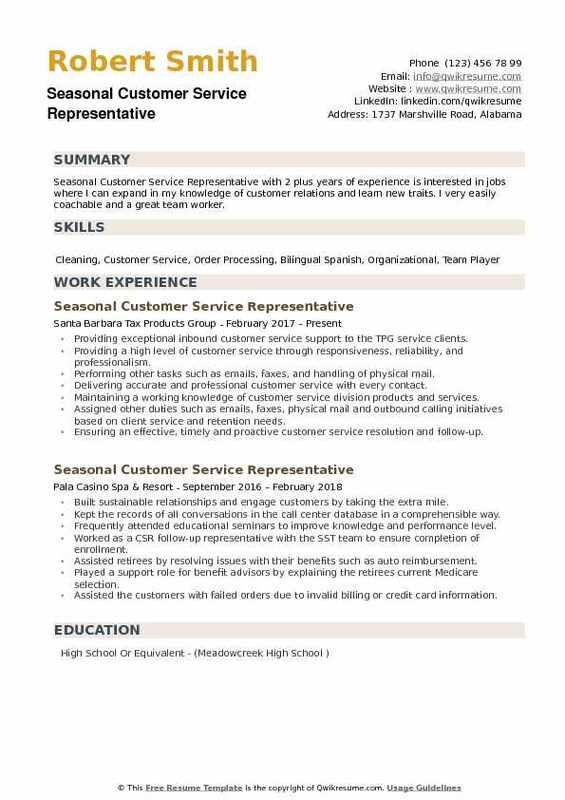 Summary : Senior Seasonal Customer Service Representative with 8 years of experience seeking a position with a company where I can maximize my years of office and customer service experience. A business that can enable my strong organizational skills. Assisted customers in selecting internet options for browsing along with navigation and placing orders on the website. Communicated and managed customer conflict resolution in a professional manner. Handled all basic frequently occurring situations regarding order placement, order and return status issues, and current product information. Effectively used decision-making skills, critical thinking, and elements of effective communication used appropriate telephone etiquette and interpersonal skills. Analyzed needs, qualified, and referred the products customers to the proper sales channels, researched inquiries and de-escalated customers concerns. Kept records of taxpayers interactions and transaction, recording details of inquiries, complaints, comments, as well as actions taken. Resolved customer inquiries into their delayed shipments and credit card transactions. Provided promotional credits as well as gave information on current and future promotions. Objective : Jr. Seasonal Customer Service Representative with 2 years of experience is seeking to succeed in an environment of growth and excellence and earn a career which provides me job satisfaction and self-development and help me achieve personal as well as organizational goals. 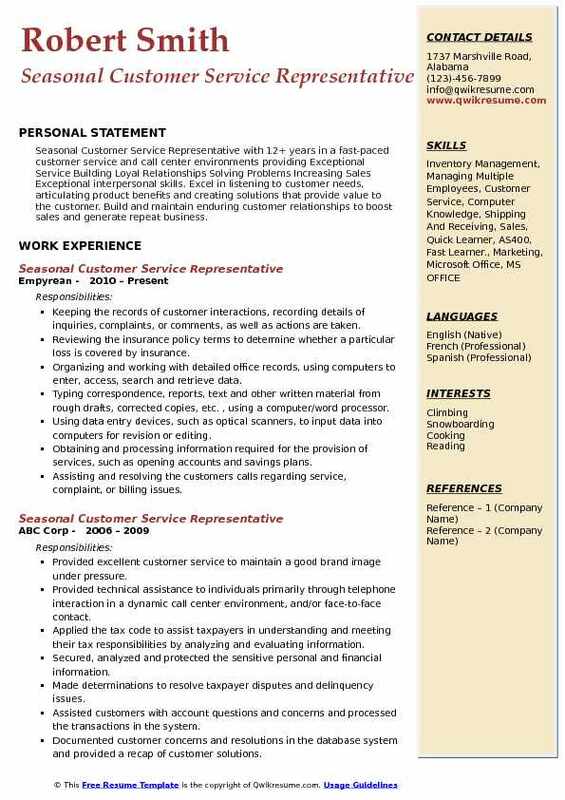 Skills : MS Word, Excellent Communication, And Customer Service, Data Entry, Coordination And Organization, Self Motivated, 10 Key Adding Machine, Cash Handling Experience, Well Knowledged On CSG And WFX Programs. Engaged and assisted customers who are calling to place an order, check product inventory, inquire on product pricing, or have a question on their order, account, or invoice. Up-sold/cross-sold products to customers to maximize sales opportunities and increase revenue. Provided accurate inventory status, shipping time frames, and tracking information (US/USPS). Identified and resolved customer issues regarding returns, replacements, damaged merchandise, etc. Achieved contact center performance measurements in call quality, average handle time, average order value, and adherence and recognized as the top 10 in providing exceptional customer service. Consistently demonstrated the ability to serve customers by applying sound judgment and decision-making skills to effectively and efficiently. Demonstrated positive, enthusiastic, and professional behavior, with both customers and co-workers, to increase customer satisfaction and department morale. Possessed a thorough knowledge and skill base of products, operations, policies and procedures, and computerized information systems. 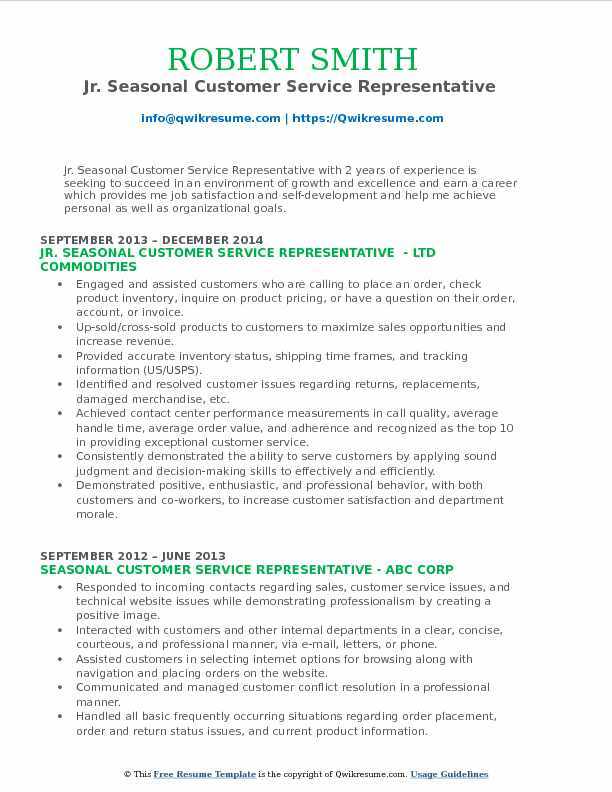 Objective : Seasonal Customer Service Representative with 4 years of customer service experience seeking a position in a professional environment with growth potential, where I may utilize my outstanding leadership skills. 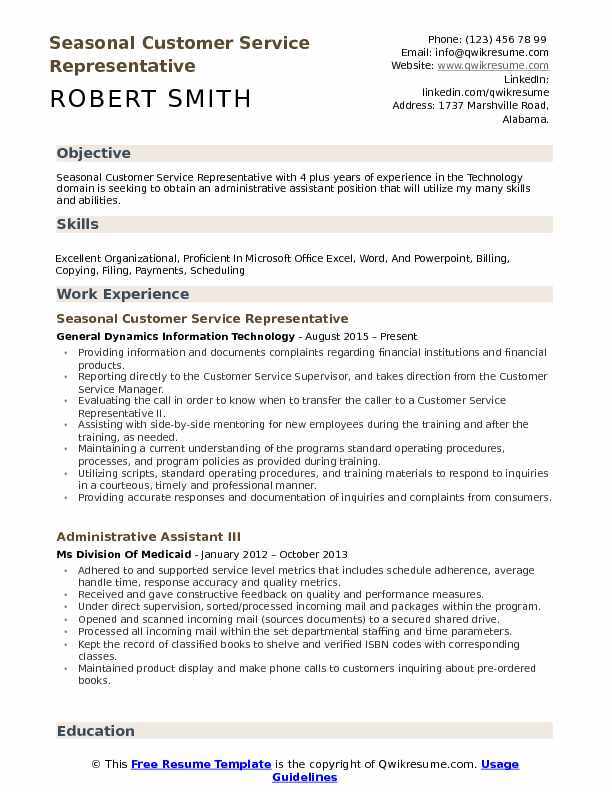 Skills : Excellent Communication, Organizational, Presentation, And Analytical, Knowledgeable In Computer Software Including Microsoft Office 365 And Salesforce. Increased sale volume meeting daily quotas 70+ calls during a fulltime shift. Assisted customers with wedding registry, membership, and processed orders. Performed general supervisor duties such as assisting and training employees. Worked with customer concerns for complete customer satisfaction on their order and experience with the company. Responsible for necessary documentation for all customer information and orders. Collaborated with the team members and supervisors to efficiently complete tasks and set goals. Maintained above average rating of 4.93 out of 5 on a customer review platform: Stella Connect. Communicated in a professional manner with current and prospective customers via e-mail or phone to process orders, answer questions or concerns. Toggled through multiple systems efficiently by quickly learning new software programs. Summary : Seasonal Customer Service Representative with 12+ years in a fast-paced customer service and call center environments providing Exceptional Service Building Loyal Relationships Solving Problems Increasing Sales Exceptional interpersonal skills. Excel in listening to customer needs, articulating product benefits and creating solutions that provide value to the customer. Build and maintain enduring customer relationships to boost sales and generate repeat business. Keeping the records of customer interactions, recording details of inquiries, complaints, or comments, as well as actions are taken. Reviewing the insurance policy terms to determine whether a particular loss is covered by insurance. Organizing and working with detailed office records, using computers to enter, access, search and retrieve data. Typing correspondence, reports, text and other written material from rough drafts, corrected copies, etc. , using a computer/word processor. Using data entry devices, such as optical scanners, to input data into computers for revision or editing. Obtaining and processing information required for the provision of services, such as opening accounts and savings plans. Assisting and resolving the customers' calls regarding service, complaint, or billing issues. Ensuring the accurate customer resolution by continually learning new and effective ways of providing excellent customer service. Established a strong customer service relationship by assisting customers in a timely manner and being punctual while maintaining a 100% reliability score. 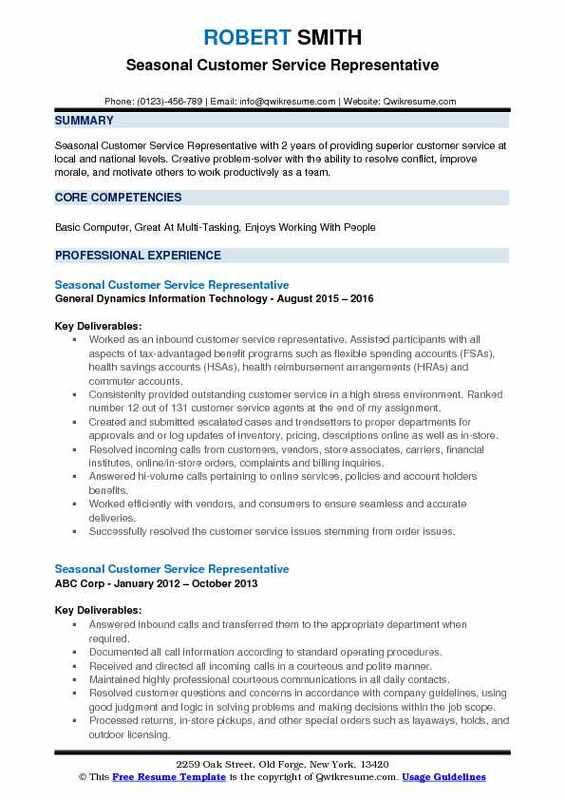 Objective : Seasonal Customer Service Representative with 2 plus years of experience is interested in jobs where I can expand in my knowledge of customer relations and learn new traits. I very easily coachable and a great team worker. Providing exceptional inbound customer service support to the TPG service clients. Providing a high level of customer service through responsiveness, reliability, and professionalism. Performing other tasks such as emails, faxes, and handling of physical mail. Delivering accurate and professional customer service with every contact. Maintaining a working knowledge of customer service division products and services. Assigned other duties such as emails, faxes, physical mail and outbound calling initiatives based on client service and retention needs. Ensuring an effective, timely and proactive customer service resolution and follow-up. Responsible to work any shift given during tax season and to show that we can be a team.